Postprandial enrichment of triacylglycerol-rich lipoproteins with omega-3 fatty acids: lack of an interaction with apolipoprotein E genotype? We have previously demonstrated that carrying the apolipoprotein (apo) E epsilon 4 (E4+) genotype disrupts omega-3 fatty acids (n − 3 PUFA) metabolism. Here we hypothesise that the postprandial clearance of n − 3 PUFA from the circulation is faster in E4+ compared to non-carriers (E4−). The objective of the study was to investigate the fasted and postprandial fatty acid (FA) profile of triacylglycerol-rich lipoprotein (TRL) fractions: Sf >400 (predominately chylomicron CM), Sf 60 − 400 (VLDL1), and Sf 20 − 60 (VLDL2) according to APOE genotype. Postprandial TRL fractions were obtained in 11 E4+ (ϵ3/ϵ4) and 12 E4− (ϵ3/ϵ3) male from the SATgenϵ study following high saturated fat diet + 3.45 g/d of docosahexaenoic acid (DHA) for 8-wk. Blood samples were taken at fasting and 5-h after consuming a test-meal representative of the dietary intervention. FA were characterized by gas chromatography. At fasting, there was a 2-fold higher ratio of eicosapentaenoic acid (EPA) to arachidonic acid (P = 0.046) as well as a trend towards higher relative% of EPA (P = 0.063) in the Sf >400 fraction of E4+. 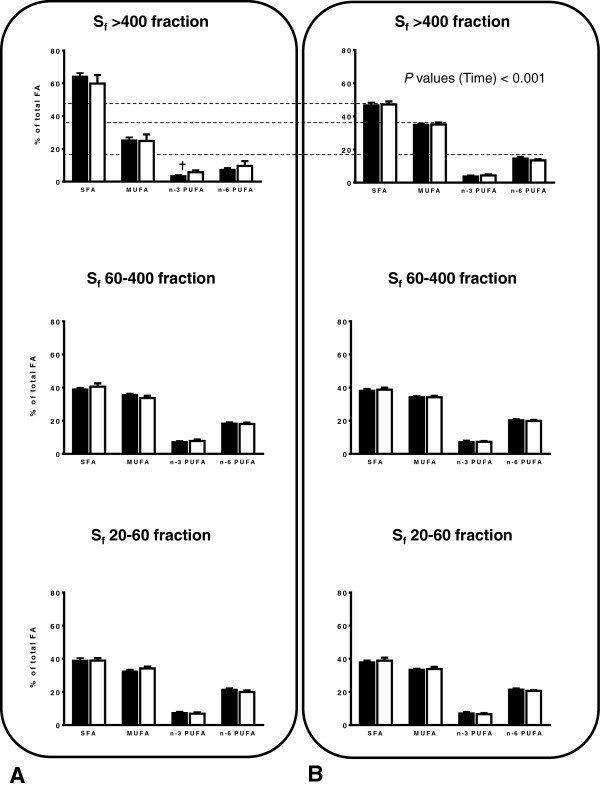 Total n − 3 PUFA in the Sf 60 − 400 and Sf 20 − 60 fractions were not APOE genotype dependant. At 5 h, there was a trend towards a time × genotype interaction (P = 0.081) for EPA in the Sf >400 fraction. When sub-groups were form based on the level of EPA at baseline within the Sf >400 fraction, postprandial EPA (%) was significantly reduced only in the high-EPA group. EPA at baseline significantly predicted the postprandial response in EPA only in E4+ subjects (R 2 = 0.816). Despite the DHA supplement contain very low levels of EPA, E4+ subjects with high EPA at fasting potentially have disrupted postprandial n − 3 PUFA metabolism after receiving a high-dose of DHA. A higher intake of fish-oil containing long chain n − 3 polyunsaturated fatty acids (n − 3 PUFA) is known to decrease the risks of cardiovascular disease (CVD) and potentially cognitive decline in the elderly. However, carriers of the apolipoprotein (apo) E ϵ4 allele (E4+), the most important genetic risk factor for Alzheimer’s disease (AD), do not seem to be protected against cognitive decline through fish consumption. In humans, three principal isoforms of APOE (i.e. APOE2, APOE3 and APOE4) resulting from six genotypes (i.e. ϵ2/ϵ2, ϵ2/ϵ3, ϵ2/ϵ4, ϵ3/ϵ3, ϵ3/ϵ4 and ϵ4/ϵ4) have been identified. Even if results are still inconsistants, most studies aiming to investigate the response to fish-oil supplementation according to APOE genotype suggested greater lipid responsiveness in E4+ carriers compared to non-carriers (E4−). ApoE is found on the surface of chylomicron remnants, VLDL and HDL2 particles where it acts as a ligand for low density lipoprotein receptor family (LDLR), thus playing an important role in the regulation and transport of exogenous (i.e. dietary lipids) and endogenous (i.e. derived from the liver) fatty acids (FA). After a high-fat meal, plasma triacylglycerol (TG) levels are temporarily raised through hepatic (i.e. from VLDL) as well as intestinally derived lipids (i.e. from chylomicron particles). This normal transitory rise in blood TG is referred to as postprandial lipemia. In literature, APOE genotype has been proposed as an important genetic determinant of the interindividual variability in postprandial lipemia[8, 9]. The differencial affinity of APOE isoform for its clearence receptors, the preferential incorporation of apoE4 within TG-rich lipoproteins (TRL), and its modulating action on size and lipid composition of plasma TRL may all explain part of the APOE genotype-induce variability in lipid metabolism[6, 10]. Recently, Liang et al. reported that APOE genotype was not significantly associated to differencial modification in levels of DHA and EPA within TC, TG or LDL-C, but was significantly associated to their concentrations with HDL-C. Supporting differential lipid metabolism between E4+ and E4− subjects, our previous results have demonstrated that postprandial β-oxidation of DHA was higher in E4+ and that increment of plasma level of DHA following fish-oil supplementation was reduced in this population[12, 13]. Studying the metabolism of n − 3 PUFA in E4+, by understanding how n − 3 PUFA are transported in TRL, could help establish effective n − 3 PUFA dosage and duration for disease prevention in E4+ patient. Our hypothesis is that the clearance of n − 3 PUFA is faster in E4+ subjects, resulting in lower% of circulating n − 3 PUFA in postprandial TRL after acute DHA intake. This study is a secondary analysis looking at the responses to an 8-wk diet high in fat and saturated fat supplemented with 3.45 g/d of DHA (HSF-DHA diet) and to the postprandial response to a macronutrient matching HSF-DHA test-meal according to APOE genotype. Therefore, our objective was to determine the FA profile in different TRL (Svedberg flotation rate: Sf >400 (predominately chylomicrons), Sf 60 − 400 (very low density lipoprotein 1; VLDL1) and Sf 20 − 60 (VLDL2)) isolated at fasting (0 h) and 5-h after eating a high-fat test-meal containing DHA (3.45 g) in E4+ and E4− men. The characteristics of the E4− and E4+ participants matched for age and BMI are shown in Table 1. There was no difference in plasma lipids or glucose levels between the two genotype groups following the 8-wk HSF-DHA diet − referred as baseline. The plasma concentration of apoE differs significantly between E4− and E4+ participants since E4+ had 28% less plasma apoE (μg/mL) when compared to non-carriers after the 8-wk HSF-DHA diet. The test-meal was well tolerated by all participants. Only one of the recruited subjects (from the E4+ group) dropped the study protocol. Values are presented as mean ± SEM. P values were obtained using one-way ANOVA in SPSS version 22.0 (IBM Corp., Armonk, NY). Bold characters are used to indicate significant effects (P < 0.05). ApoE: Apolipoprotein E; BMI: Body mass index; CRP: C-reactive protein; HDL-C: High-density lipoprotein-cholesterol; LDL-C: Low-density lipoprotein-cholesterol; NEFA: Non-esterified fatty acids; TG: Triacylglycerol. The fatty acid profile was performed after the participants received the HSF-DHA diet for 8 weeks. Overall, there was limited APOE genotype effect on fasting and postprandial FA profile of the TRL fractions (Figure 1A and B). Fatty acid profile of TRL (top figures, S f >400; middle figures, S f 400 − 60; bottom figures, S f 20 − 60) in E4− (■) and E4+ (□) at A) fasting and B) in postprandial. ANOVA was used to investigate the presence of significant difference according to time and according to APOE genotype for the relative% of saturated fatty acids (SFA), monounsaturated fatty acids (MUFA), omega-3 and omega-6 fatty acids (n − 3 PUFA and n − 6 PUFA). ✝ Trend effect for genotype (P = 0.084). Following the 8-wk DHA enriched diet, the relative% of fasting DHA in Sf >400 fraction significantly predicted the level of plasma TG, independently of APOE genotype (R 2 = 0.468, P = 0.010, data not shown). Besides a trend towards higher relative% of EPA and n‒3 PUFA at fasting in E4+ subjects compared to E4− (P = 0.084, Figure 1A), all other FA did not differ according to APOE genotype (Table 2). The ratio of EPA to arachidonic acid (AA, 20:4 n − 6) was >2-fold higher in Sf >400 fraction of E4+ subjects compared E4− with respective values of 2.4 ± 0.8 vs. 1.1 ± 0.5 (P = 0.046, data not shown). At fasting, 16:0 (34%), 18:0 (24 − 27%) and 18:1 n − 9 (22%) were the main FA whereas alpha-linoleic acid (ALA, 18:3 n − 3) composed 47% of total n − 3 PUFA (Table 2). There was a significant correlation between the relative% of DHA at fasting and the concentration of triacylglycerol (TG), non-esterified FA (NEFA), small and dense LDL-C and C-reactive protein (CRP) concentrations within the Sf >400 fraction. Similarly, the relative% of 18:2 n − 6 at fasting was correlated to the concentration of small and dense LDL-C (r = 0.615, P = 0.025, data not shown). Values are presented as mean relative percentages ± SEM or as change (Δ) compared to fasted state (i.e.% at postprandial value –% at fasting value). P values were obtained using a Factorial Repeated Measures (Split-Plot) ANOVA in SPSS version 22.0 (IBM Corp., Armonk, NY). Bold characters are used to indicate significant effects (P < 0.05). Five hours after receiving the test meal, none of the tested FA in the Sf >400 fraction were APOE genotype-dependant (Table 2). There was no significant time × genotype effect for any of the FA (Table 2). However, there was a trend towards a significant time × genotype interaction on the relative% of EPA (P = 0.081). The relative% of EPA in postprandial was strongly correlated with DHA (r = 0.875, P < 0.001, data not shown). Five hours after receiving the HSF-DHA test-meal, the postprandial relative% of SFA in the Sf >400 was significantly reduced compared to fasting, whereas the relative% of both MUFA and total n − 6 PUFA were increased. These time effects were independent of APOE genotype (Figure 1B). EPA level at fasting, had a significant impact on the postprandial response (ΔEPA) to the test-meal (P = 0.021) Since EPA level at fasting tended to change the postprandial response of EPA within the Sf >400 fraction, two groups were formed based on the median level of EPA at fasting in the Sf >400 fraction (low-EPA sub-group = EPA < 1.0% vs. high-EPA sub-group = EPA > 1.0%). There was a significant interaction between fasting EPA-status (i.e. low or high) and APOE genotype (P interaction = 0.036; Figure 2). Postprandial EPA was 7-fold lower in participants in the high-EPA sub-group than in the low-EPA sub-group (Figure 2A). 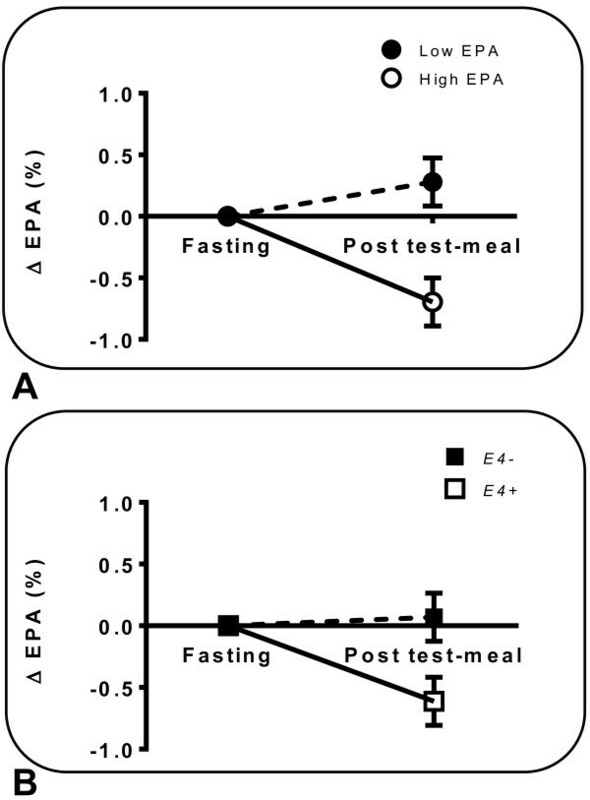 Similarly, the postprandial response for EPA (ΔEPA) after the test-meal was greater in E4+ subjects (Figure 2B). In multiple regression analysis, the relative% of EPA in Sf >400 lipoproteins at fasting, significantly predicted the postprandial response in EPA (ΔEPA) only in E4+ subjects (R 2 = 0.816, P < 0.014, data not shown). Changes in the eicosapentaenoic acid (ΔEPA) content of postprandial S f >400 lipoproteins depending on: A) EPA-status at fasting (N = 11 or 12/group); B) APOE genotype (N = 11 or 12/group) ; E4− (■) and E4+ (□). Median fasting level of EPA in Sf >400 lipoproteins was used to create the low <1.0% (●) and high >1.0% sub-groups (○). Factorial Repeated Measures (Split-Plot) ANOVA was used to investigate the presence of significant interaction. P value for EPA-status at fasting × genotype interaction was = 0.036. At fasting, relative% of all tested FA were independent of APOE isoforms. At fasting, the fatty acid profile of the Sf 60 − 400 fraction was mainly 16:0 (29%), SA (8 − 9%) and 18:1 n‒9 (30%). The main n − 3 PUFA was DHA (Table 3). Values are presented as mean relative percentages ± SEM or as change (Δ) compared to fasted state (i.e.% at postprandial value –% at fasting value). P values were obtained using a Factorial Repeated Measures (Split-Plot) ANOVA in SPSS version 22.0 (IBM Corp., Armonk, NY). Bold characters are used to indicate significant effects (P < 0.05). †Trend effect was set at P < 0.09. Five hours after the HSF-DHA test-meal, the relative% of all tested FA were independent of the APOE genotype (Table 3). DHA represented 59% and 62% of total n − 3 PUFA in E4− and in E4+ respectively. There was no significant time × genotype interaction or independent genotype effect on the postprandial FA profile of Sf 60 − 400 lipoproteins (Table 3). The relative% of 18:2 n‒ 6 in postprandial was positively correlated to LDL-C and the relative% of 18:3 n‒3 was positively correlated to HDL-C (data not shown). At fasting, relative% of all tested FA were independent of APOE isoforms with the exception of, which was significantly lower in E4+ compared to E4− (Table 4). At fasting, 16:0 (28%), 18:0 (9%) and 18:1 n‒9 (28 − 30%) were the main FA. Half of total n − 3 PUFA was DHA. The relative% of AA at fasting was significantly correlated to plasma concentration of apoE (r = 0.496, P = 0.019; data not shown). In multiple regression, HDL-C concentration was able to predict the variation of AA at fasting (%) only in E4+ subjects (R 2 = 0.492, P = 0.010; data not shown). Five hours after the HSF-DHA test-meal, the relative% of FA were all independent of the APOE genotype (Table 4). There was no significant time × genotype interaction for any of the tested FA (Table 4). The relative% of 18:3 n‒3 at fasting was positively correlated to the postprandial level of ALA (r = 0.553, P = 0.009), EPA (r = 0.611, P = 0.003), DHA (r = 0.479, P = 0.028) and to plasma concentration of HDL-C (r = 0.592, P = 0.004). It was also negatively correlated to plasma concentration of TG (r = −0.510, P = 0.015) (data not shown). Contrary to our hypothesis, total n − 3 PUFA levels of the TRL fractions after a chronic DHA supplementation for 8-wk (3.45 g/d) was not significantly dependent on APOE genotype. However, there was a >2-fold higher ratio of EPA:AA in the Sf >400 fraction as well as a trend towards higher levels of EPA at fasting in E4+ subjects compared to E4‒. When groups were formed based on fasting EPA in Sf >400 lipoproteins, the postprandial response for EPA was greater in E4+ from the high-EPA sub-group. EPA enrichment of lipoproteins at fasting predicted more than 80% of the EPA-response in E4+ subjects following the prescribed DHA supplementation for 8-wk (3.45 g/d). These results suggests that in E4+, the response to fish-oil supplementation is dependant of the fasting EPA-status. The greater reduction of EPA in the Sf >400 lipoproteins of the E4 + from the high fasting EPA sub-group, may potentially be explained by enhanced hepatic uptake of large TRL. In accordance with this hypothesis, apoE4 has a greater affinity for the low density lipoprotein receptor (i.e. LDL-R), hence, enhancing its clearance from blood. Since apoE4 preferentially incorporates into large TLR particles[6, 10], Sf >400 lipoproteins may be preferentially and more rapidly cleared in E4 +. Therefore, EPA clearance may be faster in E4 + and EPA may thereafter be preferentially catabolized or metabolized in the liver due to its poor incorporation into cell membranes . Thereafter, subjects may preferentially catabolize EPA. This hypothesis is supported by results from in vivo and in vitro experiments in which TG-lowering action of fish-oil supplementation was explained throughout enhance mitochondrial lipid catabolism (i.e. β-oxidation)[14, 15]. As explained by Olano-Martin et al., reduction of TG after EPA and/or DHA supplementation is partially attributable to up-regulation of genes involved in FA catabolism. Recent work from our group suggested that FA uptake and FA β-oxidation by the liver of apoE-targeted replacement mice expressing human APOE4 genotype is enhance through increase concentrations of hepatic carnitine acyl­transferase (CPT1), the limiting enzyme of FA β-oxidation. Moreover, FA preference towards β-oxidation may be modify in E4+ as suggested in a previous study. The greater reduction of EPA, with no apparent reduction in DHA, can be related to preferential catabolism of EPA over DHA, as DHA is a much poorer substrate than EPA for the acyl-CoA synthase[14, 18]. These latter hypotheses and the underling mechanisms are as yet speculative and need further investigation. Even if our results seem to suggest that the isoform-specific action of APOE genotype is limited and mostly affects FA profile of large TRL (i.e. Sf > 400 fraction), a complete picture of the APOE isoform-specific modulation of n − 3 PUFA transport and clearance by adding FA profiles of LDL and HDL particles would have added to the present results − these lipoproteins were not available for us to analyse. However, in accordance with our results, the greater sensitivity of fasting and postprandial TG to dietary DHA intake in E4+ is usually explained throughout isoform-specific modulation of TLR metabolism rather than to LDL and HDL particles. Trials investigating DHA supplementation generally report a dose‒dependent increase in both plasma DHA and EPA. For example, in the 8-wk HSF-DHA diet of the SATgenϵ study, there was a 2-fold increase of DHA and EPA in plasma phospholipids in E4+ and E4‒. The lack of APOE isoform-specific postprandial response during acute DHA ingestion in this follow-up study could simply result from the enrichment of TRL at baseline, which occurs whilst the HSF-DHA diet for 8-wk. This enrichment may have masked any subtle changes in the postprandial response between E4− and E4+ subjects. Greater modulation of postprandial response to n − 3 PUFA supplementation may be possible through intake of EPA enriched test-meal rather than DHA enriched test-meal. Indeed, Cazzola et al. proposed based on their dose–response investigation on normotriacylglycerolaemic males supplemented 1.4 to 4.05 g EPA/day for 12-wk, that EPA may be responsible for the TG-lowering action of fish oil. These hypotheses are speculative and deserve to be tested in future investigation according to APOE genotype. AA was lower in Sf 20 − 60 lipoproteins of E4+ at fasting. This is an intriguing result since usually AA rarely varies in plasma lipids. A significant reduction in AA (‒14 μmol/L) was reported while studying postprandial response to a 7-week supplementation with n − 3 PUFA (1 g/d EPA and DHA) in normolipaemic individuals, with no regards to APOE genotype. Thus, the lower level of plasma AA in fasted E4+ subjects may have result from the greater responsiveness of E4+ to the prior 8-wk HSF-DHA diet. AA kinetics has never been studied in humans so whether APOE genotype significantly changes its kinetics remains to be established. This study has strengths and limitations. The main limitations are related to the high saturated fat content of the HSF-DHA-rich test meal (53 g of fat), to lipoprotein FA profile in relative% rather than in concentration, and finally to the use of a single postprandial time-point (5 h) for this analysis. Indeed, fat quality and quantity, as well as the vehicle in which DHA is administered, may all affect postprandial lipid response to acute ingestion and thus, may mask subtle changes according to APOE genotype. Finally, providing FA profile in concentrations rather than in relative% would have been informative but unfortunately this analysis was not performed and due to the limited volume of sample available, this analysis cannot be performed. This would have given complementary information regarding FA profiles, especially with regards to the level of each TRL according to APOE genotype. This study represents a secondary analysis of a trial designed to investigate dietary fat quality and quantity on postprandial lipid metabolism according to APOE genotype. Since recent evidences from another group suggest different metabolic activities after EPA and DHA supplementation, and considering that Cazzola et al. proposed that EPA may be more potent at reducing plasma TG than DHA, studying the response to chronic and acute EPA intake, on the FA profile of TRL according to APOE genotype, and not in a context of HSF diet, would be of great interest. This study reported that FA profile of large TRL (Sf >400) is the most modified by chronic and acute DHA intake and that it is not APOE-isoform dependant. Despite the prior HSF-DHA diet contained very low levels of EPA, E4+ subjects with high fasting plasma levels of EPA potentially have disrupted postprandial n − 3 PUFA metabolism after receiving an acute high-dose of DHA. In future trial design, looking at the interaction between participant’s EPA-status at baseline and APOE genotype on the response to EPA and/or DHA supplementation should be considered. Twenty-three men − 12 E4− (ϵ3/ϵ3) and 11 E4+ (ϵ3/ϵ4) − participating in the SATgenϵ study also undertook postprandial studies at the end of three iso-energetic 8-wk diets: 1) low-fat diet (LF); 2) high-fat, high saturated fat (HSF); 3) HSF + 3.45 g/day DHA (HSF-DHA) diets. All participants consumed the three diets in the same order, without in between washout period. The present postprandial study only investigated the chronic and acute response to HSF-DHA diet in E4− and E4 + men. Complete details of the SATgenϵ dietary intervention and of the postprandial investigation have been presented in detail elsewhere[20, 22]. Briefly, twenty-four hours prior postprandial intervention, participants were asked to abstain from alcohol and to consume a low-fat meal (<0 g fat) before 8 pm in the evening. The HSF-DHA test-meal (5.4 MJ) used in this postprandial investigation matched the macronutrient composition of the dietary intervention (i.e. HSF-DHA diet) as detailed in. Briefly HSF-DHA meal was composed of (45.1% carbohydrate, 17.0% protein, 37.8% fat, of which 18.3% saturated fatty acids, 12.2% monounsaturated fatty acids, 6.6% polyunsaturated fatty acids with 0.2% EPA and 1.4% DHA). The HSF-DHA test-meal was a warm chocolate drink containing the fish-oil (DHA), with toast and jam. It was provided and consumed within 20-min. The DHA enriched test-meal contained 5.7% saturated fatty acids, 11.6% monounsaturated fatty acids, 82% polyunsaturated fatty acids, 8.3% EPA, 3.1% DPA, and 57.5% DHA, which provided 3.45 g of DHA/d + 0.19 g EPA/d (Croda Healthcare, UK). This study was approved by the University of Reading Research Ethics Committee and is registered at clinicaltrials.gov as NCT01384032. The study was conducted according to the Declaration of Helsinki’s guidelines. Participants of the SATgenϵ trial provided their informed consent for the study. After an overnight fast, subjects attended the investigation unit where an indwelling cannula was inserted into a forearm vein. Two blood samples were taken at baseline (i.e. fasting state) and 5-h after consuming the HSF-DHA test-meal (i.e. providing 3.45 g of DHA). Blood samples were transferred to heparin containing tubes and were separated by centrifugation at 1700 × g for 10 min in a bench-top centrifuge at 4°C, and stored at −20°C until analysis. In order to prevent the proteolytic degradation of the apolipoproteins, 6 μL EDTA (0.5 mol/L), 3 μL PMSF (10 mmol/L in isopropanol) and 15 μL aprotinin (10 000 kallikrein inactivator units/mL) were added immediately to the plasma. The plasma was stored overnight at 4°C until isolation of the Sf> 400 (predominantly chylomicron), Sf 60–400 (VLDL1) and Sf 20–60 (VLDL2) fractions using density gradient ultracentrifugation, as previously described. After isolation of TRL fractions (1 mL), recovered volumes were divided into portions and stored at −20°C until further analysed. Total lipids were extracted from the TRL fractions (150 μL) using the Folch method. The plasma total lipid extract was then saponified using 1 M KOH/methanol and heated at 90°C for 1-h, which hydrolyses the fatty acids from cholesterol and glycerol. After cooling to room temperature, hexane and saline were added. The hexane and cholesterol phase were discarded and the remaining saline and fatty acid salt mixture was acidified with HCl to obtain the free fatty acids. Transmethylation of the resulting non-esterified FA into FA methyl esters was performed using boron 14% trifluoride/methanol (Sigma-Aldrich, Saint-Louis, MO). FA methyl esters were analyzed using a gas chromatograph (model 6890, Agilent, Palo Alto, CA) equipped with a 50 m BPX-70 fused capillary column (SGE, Melbourne, Australia) as described in. This study represents a secondary analysis of the SATgenϵ trial conducted at the University of Reading (UK). Sample size estimation was originally performed on the expected change in postprandial TG-response between genotype groups (i.e. E4− vs. E4+). The sample size estimation was performed to allow the detection of a minimum of 238 mmol/L × min change in TG-response between genotype groups. A SD of 189 mmol/L × min in response to dietary modifications has been used for sample size calculations. Based on previous studies, the required number per genotype groups was N = 10 (alpha = 0.05 two-tailed, power = 80%). The same number of subjects (N = 10/group) was required to detect a minimum of 90 nmol/mL × h with a SD of 70 nmol/mL × h change in [13C]-DHA metabolism between E4+ and E4− with an anticipated dropout of 15%. We acknowledge all other members of the SATgenϵ research team – Ms Stacey Lockyer and Dr Andrew Carvalho-Wells. This study was supported by the Canadian Institutes of Health Research, CIHR (MOP119454) and the Wellcome Trust (WT085045MA). Croda Heathcare (UK) and Aarhus Karlshamn UK Ltd supplied the study oils. VC is supported by the medicine Fellowship grant from Université de Sherbrooke and a postdoctoral fellowship from Fond de recherche Québec- Santé (FRQ-S) and MP is supported by a Junior 1 FRQ-S salary award. The authors’ responsibilities were as follows − AMM, JAL and KGJ have designed the original sub-study within SATgenϵ study and obtained funding for the original trial; MP, AMM and KGJ designed the secondary analysis and MP obtained the funding; MJA performed the fatty acid profiles within the lipoproteins; VC performed statistical analyses; VC, MP and MJA analyzed the data; VC wrote the present manuscript and is responsible for data accuracy. All authors read and approved the final manuscript.